Plates are the bread and butter of a yeast rancher. They are quite easy to make and don’t require a lot of technical skill, but even so, one needs to have some basic skills and seeing how it’s done helps a lot. Recently I’ve been getting emails from a few people looking to get into building a home lab and start ranching so I thought a plate making tutorial would be helpful. And while we’re at it, why not also show you how to make slants? First, you need the plates. They are easy to find online for a very decent price. Personally I prefer buying sterile plastic ones on eBay (which is where I buy almost all my stuff anyway) because I buy in packs of 500, which last me about 2-3 years. 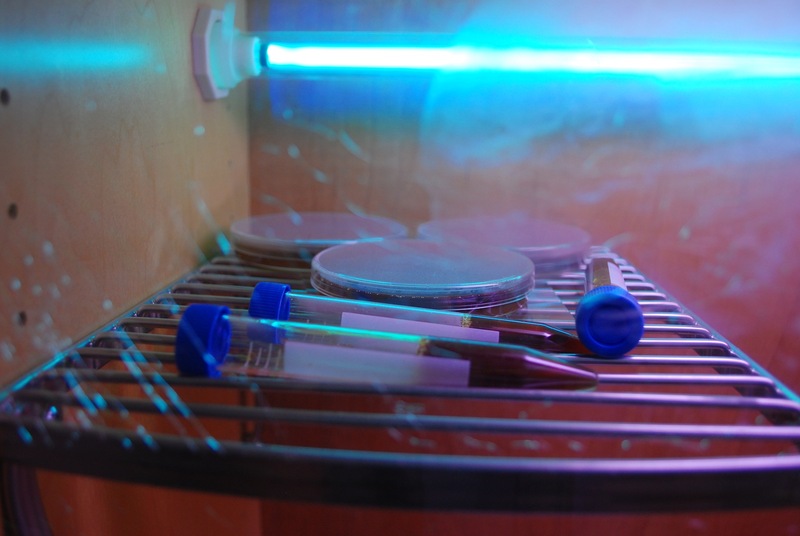 Now that I have my UV set up in the hood, mold contamination is almost entirely gone, though not completely because this is still an apartment setup, so I pour about two-three times less plates and imagine this new box of plates I just bought will last me many years. DO NOT WORK DIRECTLY UNDER UV. IT WILL BURN YOUR EYES AND SKIN. ALWAYS HAVE A SCREEN BETWEEN YOUR EYES AND UV AND IF YOU WORK IN THE HOOD WITH YOUR HANDS (OR OTHER BODY PARTS) TURN IT OFF TO AVOID INJURY! You can also get borosilicate glass plates which are reusable. They are more expensive, but the benefit is that you can use them indefinitely. I still prefer the plastic ones because they’re already sterile so I don’t need to sterilize them and there is just a lot less headache associated with them because sterilizing in a pressure cooker is always wet so glass plates will always be wet and just prone to infections. Second, you need an agar recipe and the ingredients. 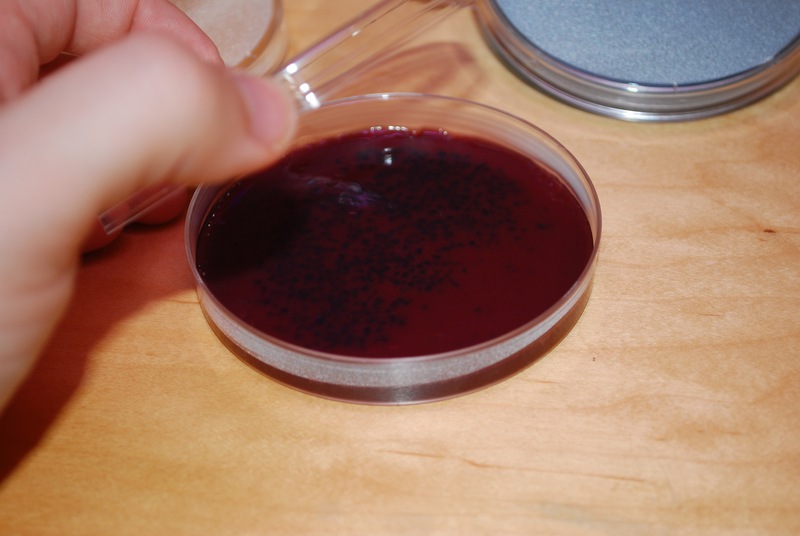 You can find every agar recipe imaginable online and ingredients for the basic ones are easy to get. Check out my recipes and give them a try. Third, put the ingredients together and cook in a pressure cooker at 15psi for 15-30 minutes, allow to cool to about 95˚F (35˚C) or thereabout, aka “kind of warm to the touch”, and pour into the plates. About 10-15mL is needed to cover a 100mm plate. 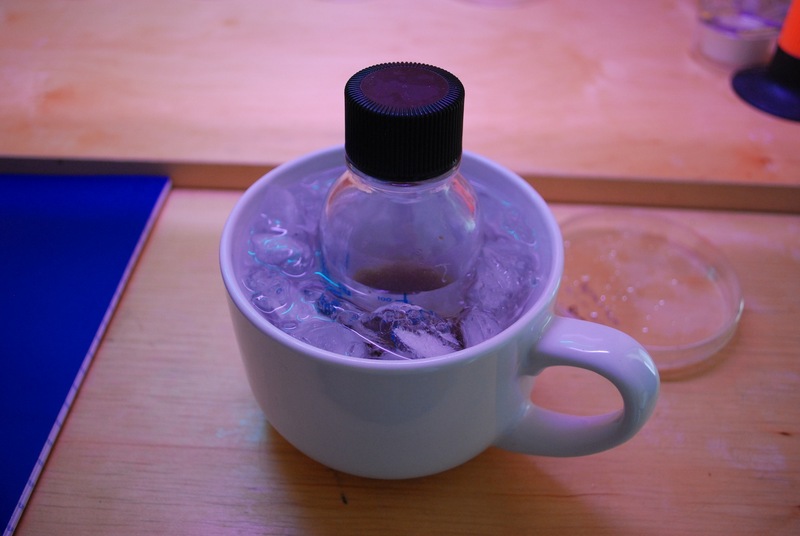 One thing you can do is put your bottle into some water with crushed ice to rapidly cool it. 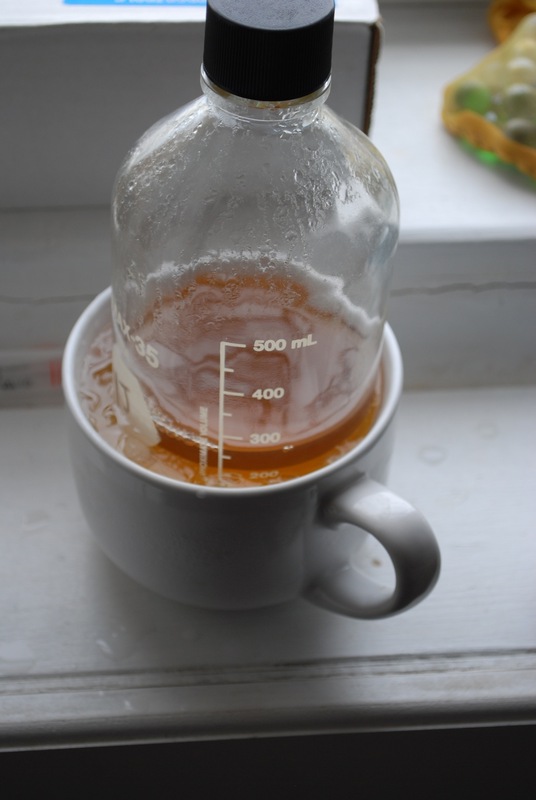 You can do this both with small and larger batches of agar. If you choose to do so, make sure you only keep it in there for a few seconds at a time and swirl it constantly. Once it sets, it sets, and you’re in trouble because melting it again is going to be worse than just making it anew. 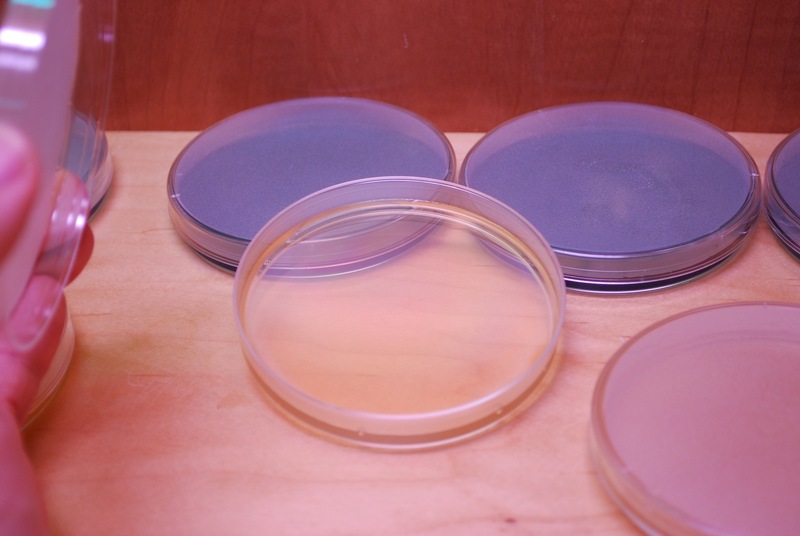 In labs people usually leave the lids ajar and let them sit and cool (typically in the hood with UV blasting at them) to avoid building up condensation inside the plate, but since this is a home lab, I’d recommend just closing the lids and letting the agar set. If you decided to go with the rapid-ice-cool method and catch your temperature just right, your plates will set within seconds. 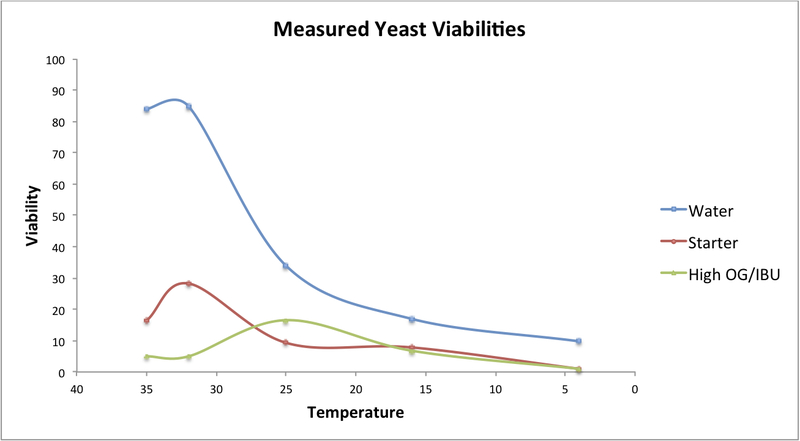 If you decided to let your agar passively cool until it’s well warm or just poured it hot, it could take up to a few minutes. If you decided to make a slant, it’s much the same thing as pouring a plate except you pour it into a tube. After pouring just tilt the tubes until you get desired angle and leave it like that to set. For doing it at home, I’ve constructed this high-tech device and used it together with an old plate to slant my tubes. 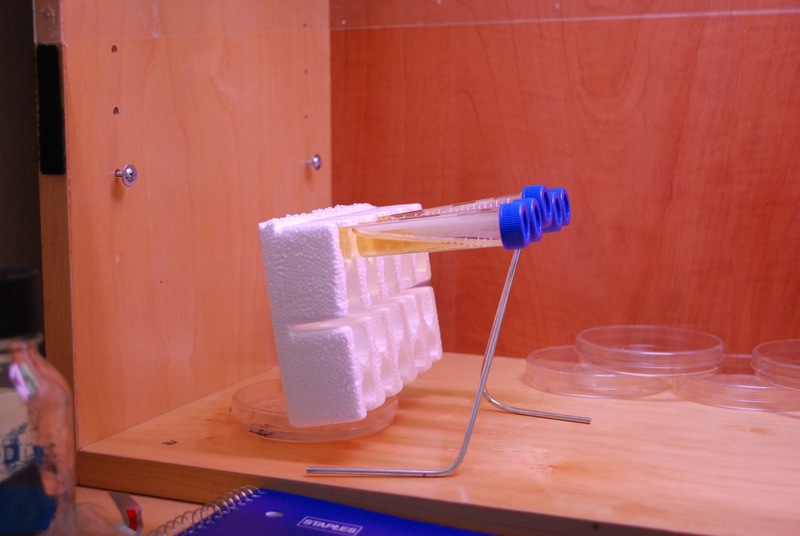 High-tech science at its best! 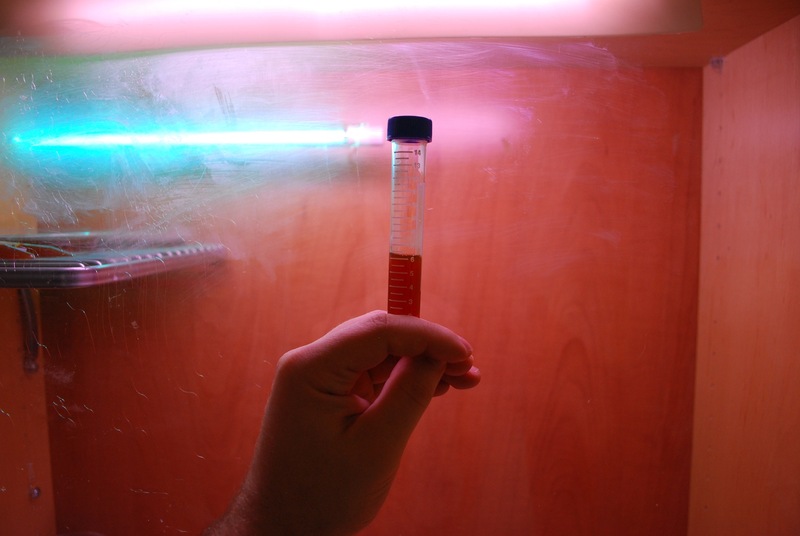 If you want to make a tube for stab cultures, just pour it and let it set without slanting. The use for such tubes will be discussed in one of the later posts for those of you unfamiliar with them. Sure this isn’t the perfect tube for making slants, but it gets the job done. 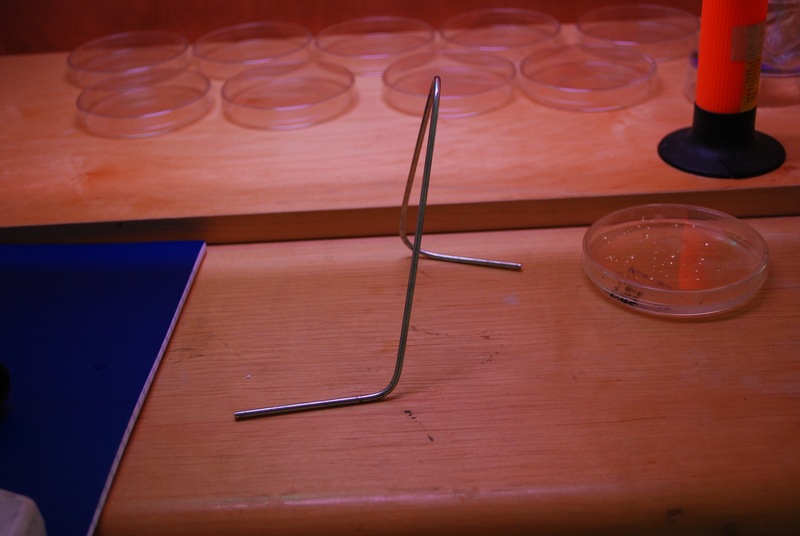 Notice how the agar comes almost to the edge of the thread. Here is a bit of a next level plate pouring which is rarely used, but I needed to make this. Put your plates on something to keep them angled. Pour one agar and let it set at an angle. That way you’ll have more of it on one side and less on the other. After it sets, pour another agar over it and let it set at an even level. 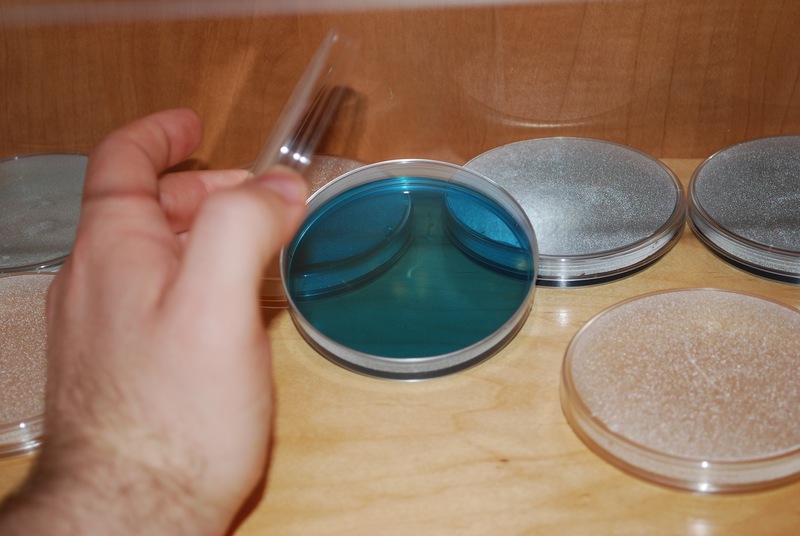 What this will do is give you plates with two types of agar on them, but one part of the plate will have more of one and other will have more of the other with a more or less even gradient of the two in between. In this case the first level was some 123 IBU IIPA wort followed by another agar. That way on one end of the plate I have a lot of hop compounds, while on the other one I have much less. 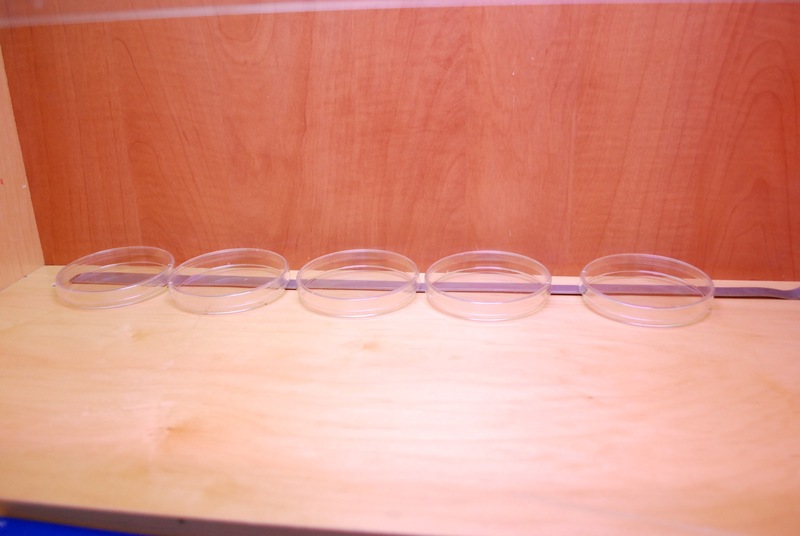 These plates will be used to help me pick the most hop resistant Lactobacillus strains. Fourth. If you want to use your plates right away go ahead and do so, but if you want to store them, you’ll need to dry them. 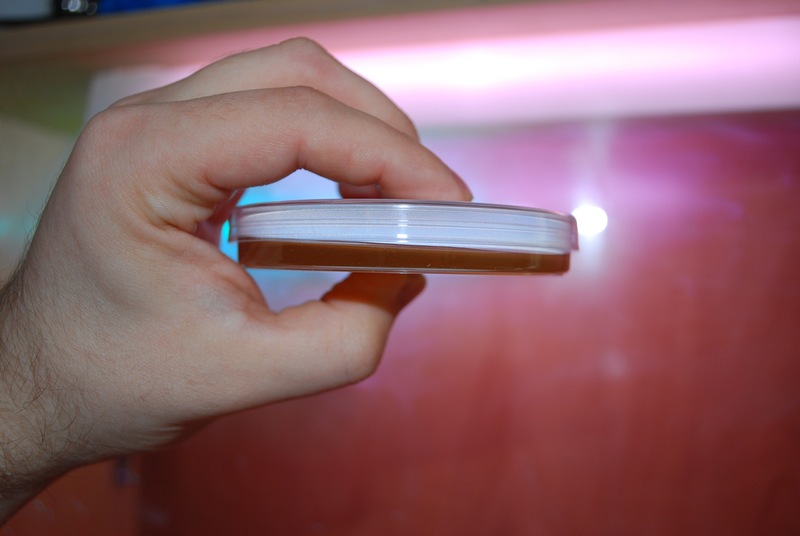 Obviously you should not dry them completely to the point where your agar almost ceases to exist – just enough to get rid of the condensation inside. My preferred method for drying is just letting them sit at room temperature for about 3-7 days, depending on when condensation disappears. Remember how I mentioned that plastic cracks under UV in one of my previous posts? Well this is what my hood screen looks like now. When the condensation inside is gone, I give them another day, then put them into a ziplock bag or the plastic sleeve in which the sterile plastic plates come and put into the fridge. Some of them will eventually get infected because no matter how much you try, there are mold spores everywhere and with humidity inside the bag of plates, some of them inevitably find their way into your plates. That’s OK though. If you do it right, it’ll be months before you see that happen. While drying I also like to let them sit under UV for a bit every day or every other day and before using them I also subject them to UV treatment for an hour or so just to make sure. 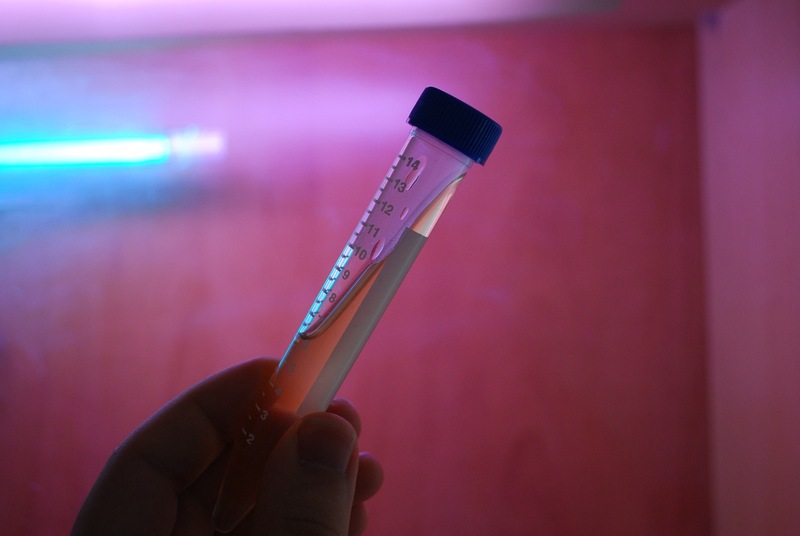 You don’t need to do UV if you don’t have it, but in my experience it reduced streaking contamination down to zero unless there is mold in the actual sample. How do you deal with bubbles while pouring plates? 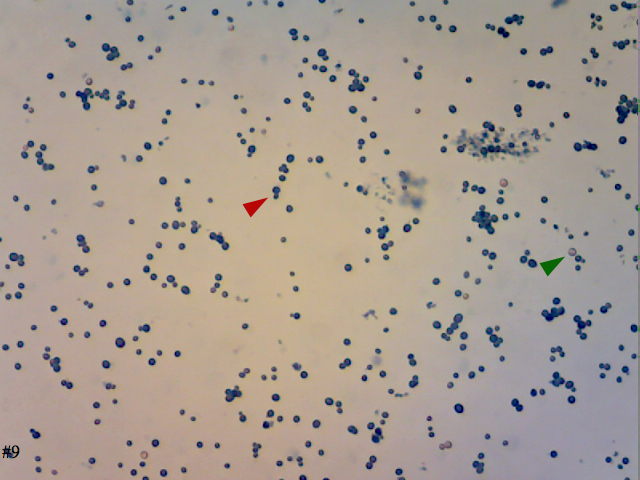 Here is some Milk Lactose Litmus Agar with some undissolved Litmus crystals in it. 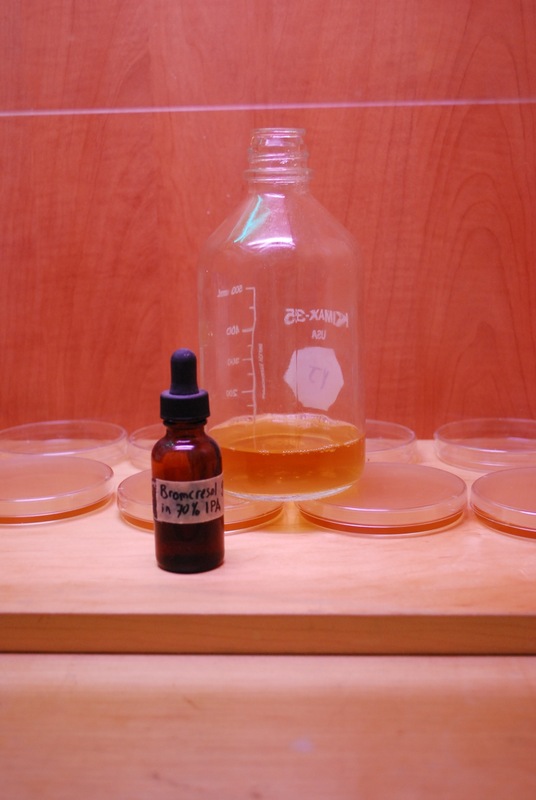 Sure it doesn’t look appetizing, but it works just the same and the dissolved Litmus is just enough to turn bright red when your yeast or bacteria produce acid! Adjusting pH with some base to around neutral will give you more purple-blue looking plates, but I forgot to do it this time. 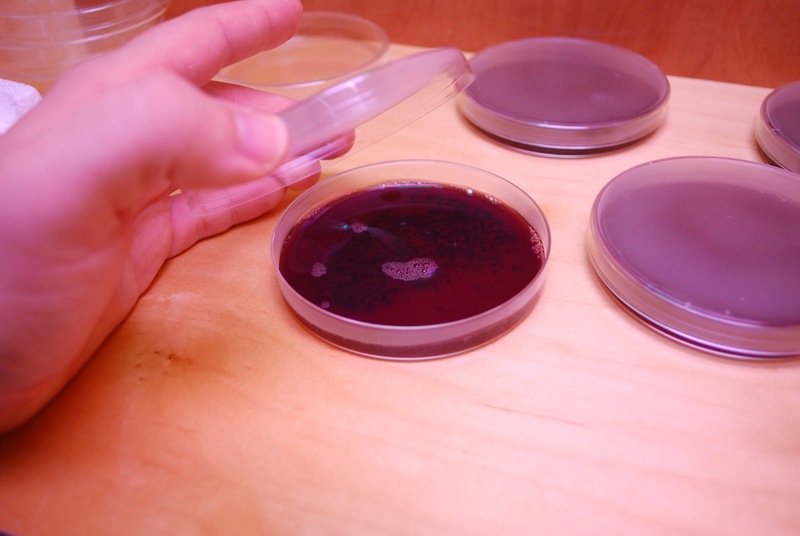 In any case, the colonies and agar get really noticeably red if there is acid production. 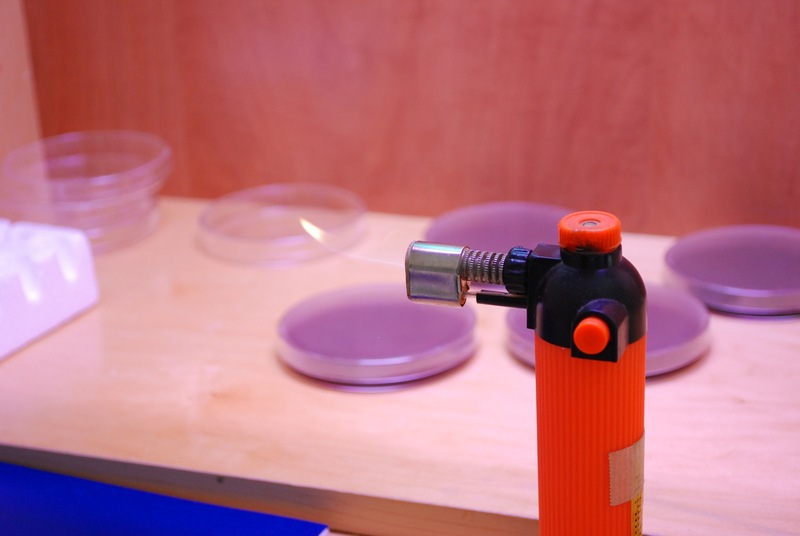 So what you do is take your trusty blow torch (mini blow torch in my case), set it to low oxygen flame by blocking the air or low flame setting, and go over the agar surface with the flame. Low oxygen/low flame because that way you’re less likely to melt and/or set your plate on fire. 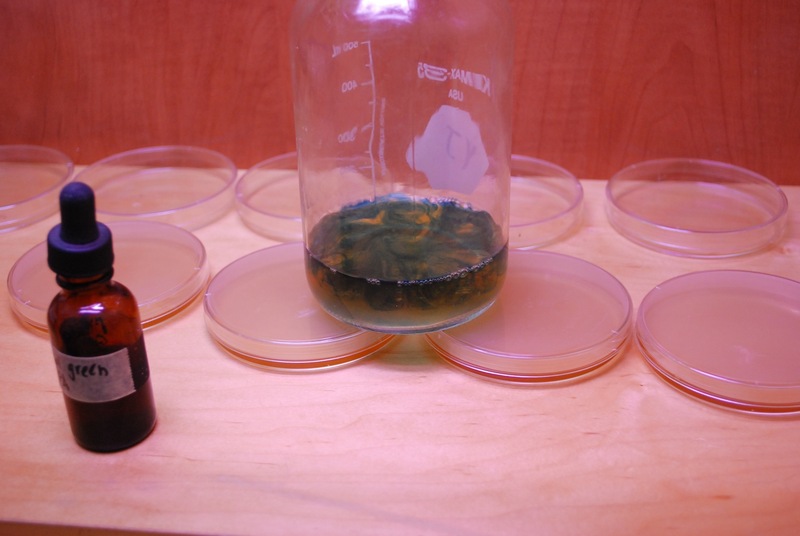 Some MYPG agar poured into plates and the rest of it ready to get its dose of Bromocresol Green. 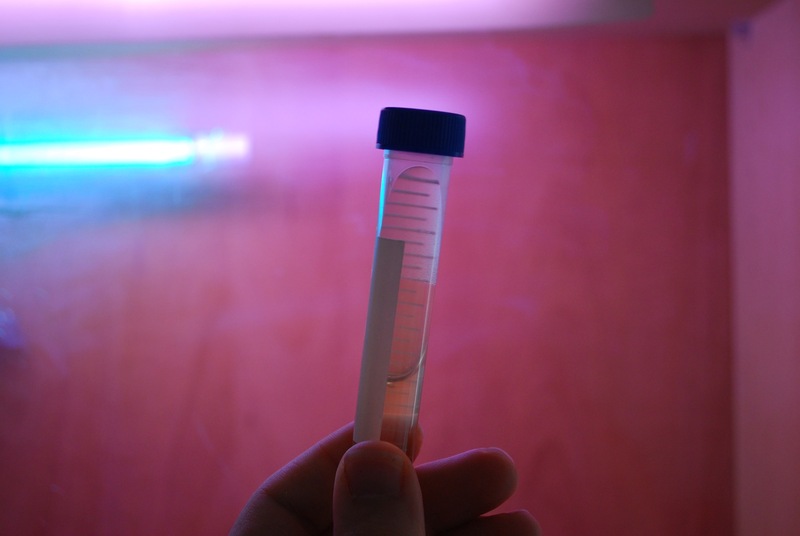 I like to keep my BG in 70% rubbing alcohol just so I don’t have to worry about sterility. Add a few drops. Looks like a blooming swirling flower when you do it. Mix gently to uniformity and pour. There you go! It’s pretty easy and from start to finish shouldn’t take you over an hour. I’ve heard of homebrewers who mix their agars, plate them, and then cook in the pressure cooker, and believe me, it’s not the way to go. This method is much simpler and much more reliable. 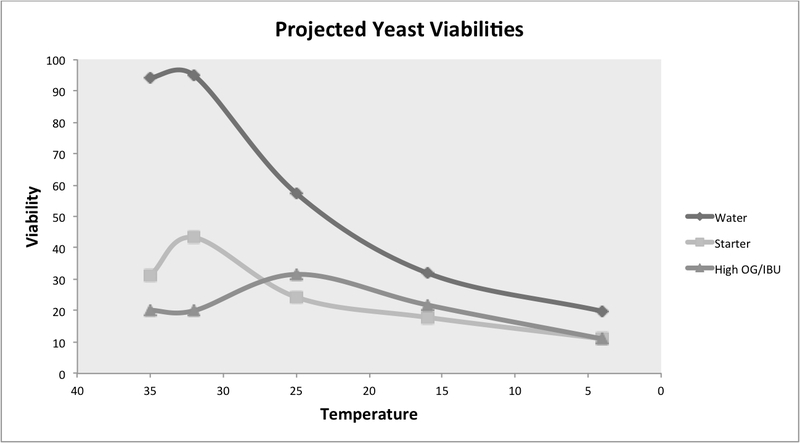 Also, the more paranoid you are about sanitation and sterility, the better your plates and resulting yeast stocks will be.